The Dutch Safety Board and Russians arms manufacturer Almaz-Antey on Tuesday told a similar story about what caused the downing of flight MH17 in eastern Ukraine last year, but had a politically charged crucial difference of opinion on what type of warhead was used – and consequently, who was likely behind the tragedy. Confirming theories that have circulated since the direct aftermath of the tragedy that killed 298 people on July 17 last year, the Dutch Safety Board (DSB) concluded the Malaysia Airlines plane had been downed by a surface-to-air Buk missile, but stopped short of saying who fired it or where exactly it was fired from. Russia has said Ukrainian troops fighting separatist rebels in the area could have shot down the plane mistakenly, while Western reports have accused Russia of providing the rebels with a missile that they used to shoot down the airliner. Standing in front of a partial reconstruction of the plane’s front built out of recovered wreckage pieces, DSB chairman Tjibbe Joustra said Tuesday the plane had been broken apart by a 9N314M warhead carried on a 9M38-series missile that exploded outside the plane to the left of the cockpit. The 9N314M is easily identified based on the distinctive hourglass-shaped damage patterns found on its targets. “This fits the kind of warhead installed in the Buk surface-to-air missile system,” Joustra said. Both the Russian and Ukrainian military use the Buk missile, but Russia operates a newer system. Hours before the Dutch investigation presented its findings, the Russian manufacturer of the Buk missile system, Almaz-Antey, held a morning press conference in Moscow to present its own version of events. At first glance, Almaz-Antey’s conclusions didn’t substantially differ from the Dutch report in that the company also fingered a Buk missile as the likely culprit in MH17’s destruction. But the Russian arms manufacturer altered its version of events, which were first presented at a press conference in June. Instead of arguing that an out of production 9M38-M1 missile was responsible, Almaz-Antey on Tuesday revised its story to point to the even older 9M38 model. “We have proved beyond doubt that the missile fired over Ukraine was a 9M38 from a Buk launched from the south near the village of Zaroshchenskoye,” Almaz-Antey CEO Yan Novikov said at the press conference. The evidence, Novikov said, is that the MH17 wreckage did not feature the distinctive hourglass-shaped shrapnel holes in the body of the Boeing 777 aircraft alluded to in the Dutch investigation report – despite the company pointing them out in June. In order to prove its point, Almaz-Antey cut the forward section off of an old Soviet-built Ilyushin Il-86 passenger liner, and positioned an older Buk missile – provided by the Russian Defense Ministry – near the nose in the same position they believe the warhead detonated, and then documented the blast pattern. Almaz-Antey noted that the blast pattern created by the missile, outfitted with the 9N314M warhead, created damage patterns the company did not see on MH17 and concluded that only an old 9M38 missile with an old warhead – which did not have the hourglass shrapnel – could have done the damage seen in the MH17 wreckage. Almaz-Antey, Russia’s largest defense company, is trying to use its argument to win a lawsuit against the European Union for placing sanctions on the company following the downing of the Boeing over Ukraine last year. “Russia has previously argued that neither the 9M38 nor 9M38M1 remain in its military service. This is not borne out by the evidence,” he said. “Russia’s claims relating to the [even older] 9M38 being responsible are inconsistent with the independent analysis of the crash by the Dutch Safety Board, by independent analysis conducted by IHS Jane’s, and by its own analysis presented in June,” de Larrinaga said. The DSB did not say where the missile had been fired from, other than citing an area of 320 square kilometers in eastern Ukraine, adding that it did not have the mandate to conduct the further forensic research needed to determine the exact launch location. Almaz-Antey focused much of its presentation on two experiments to recreate the missile’s impact with the plane, and forensically establish which direction the missile was launched from. The predominant theory in the West says that the Buk missile was fired from the rebel-held town of Snizhne in eastern Ukraine, but Almaz-Antey firmly rejects this scenario, pointing instead to the village of Zaroshchenskoye, which was further south of MH17’s flight path. This argument was based on the direction of the shrapnel patterns found in the MH17 wreckage, which were seen to enter from the left side of the cockpit and travel down the length of the plane, with some shrapnel hitting the left wing. A surface-to-air missile does not direct its shrapnel forward, but rather off to the side. Therefore, in order to create the damage pattern seen on MH17, the missile would have approached the plane from the side, rather than dead on. Since MH17 was traveling directly toward Snizhne, a missile launch from that location could not have created the damage seen on the Boeing’s body, according to Almaz-Antey, but a missile fired from Zaroshchenskoye could have. 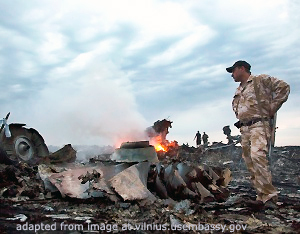 There is some debate over who controlled that town on July 17, the day MH17 was shot down. Almaz-Antey has hesitated to assign blame to either Kiev forces or the Russian backed rebels, but the Ukrainian Defense Ministry said in June this year that it had not been in control of the area at the time. Novikov told reporters that the company was ready to share its findings with the Dutch-led investigation, but never received a request from the commission. In the run-up to Tuesday, Russian officials publicly distanced themselves from the DSB’s findings. Russian Foreign Minister Sergei Lavrov in August accused the Netherlands of concealing key findings from the investigation into the downing, the TASS news agency reported at the time. Kremlin spokesman Dmitry Peskov said Monday that Moscow had “repeatedly expressed its disappointment over the lack of cooperation and involvement of Russian experts in the investigation,” TASS news agency reported. “A series of facts that have been put forward by the Russian side have been ignored for unknown reasons,” he said. Deputy Foreign Minister Sergei Ryabkov on Tuesday called the report “biased,” state-run news agency RIA Novosti reported. Russia in July also vetoed a UN Security Council proposal to set up an international tribunal to prosecute the perpetrators, with Lavrov arguing “it was introduced only to strengthen the image of Russia as a guilty party in this horrific crime,” TASS reported. The Dutch leader also called for “self-control” in resisting the urge to point fingers.